It's a Mystery! : Cool Theme Song! Wow, I came across this cool song (be sure to click on my Spaces main blog to hear it) when I was downloading some free stuff. 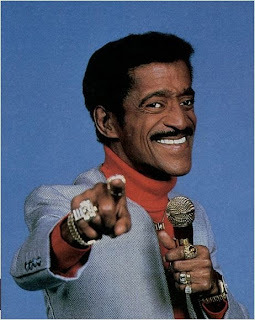 It was like hitting a gold mine for me as I am, and always have been, a huge Sammy Davis, Jr. fan. There were tons of songs that I didn't have and haven't heard. This particular song, entitled "YOU CAN COUNT ON ME" is the theme song to "Hawaii 5-O" those many years ago. There was also a hot big band version of "Plop, plop, fizz, fizz," the Alka-seltzer ad that had me rolling on the ground in laughter! Sammy also sang the theme song for "Mary Tyler Moore Show" and was featured in "Laugh-In" ("Here come the judge!") and I recently saw him guest star on an old episode of "Wild Wild West" as well. He was, in my opinion, the most all around talented member of the Rat Pack. Hope you will enjoy this song! I forgot all about Laugh In until you mentioned it but it's clear as a bell in what's left of my mind now! My goodness,, I haven't seen nor heard Sammy Davis is ages. What a hoot.